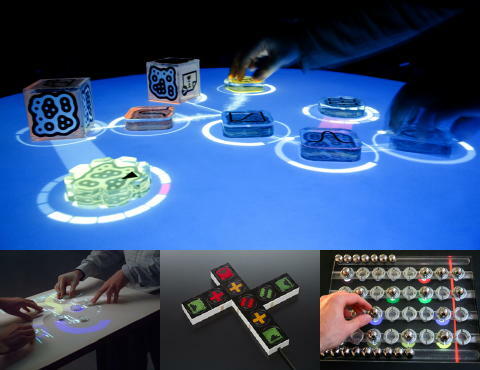 This overview of tangible musical interfaces is focusing on surface based instruments, such as music tables, audio building blocks and tangible sonic artifacts, which have been primarily chosen for their conceptual relation to the reactable project. This collection also includes several additional projects, which are somewhat closer to the concept of tangible interfaces rather than simple musical controllers. There are a few categories that roughly classify the various instruments, although some of them might fit into several categories as well. Finally this page also provides a list of musical instruments that have been built using the open source software reacTIVision, or others that have been inspired by the reactable in some way. This collection is maintained by Martin Kaltenbrunner. Please report any suggestions, updates or changes to modin_at_yuri_dot_at.